The C70 represented a new niche in an important period for Volvo, a project that was driven by enthusiasm and a love of cars by a small and passionate team. Twenty years ago, it was first shown to the world. When the Volvo C70 was first unveiled during the Paris Motor Show on 30 September 1996, it was not only the slender body that was brand new. It was Volvo’s first “proper” coupé since the 1800 model, and the first time Volvo had cooperated with engineering firm TWR on a new car. Furthermore, it was to be built partly using new methods at a newly opened plant in the Swedish town of Uddevalla. At the beginning of the 1990s, Volvo decided to expand its passenger car programme with a coupé and a cabriolet. The two versions would be developed in parallel and built on the technological base of the 850 model. A small project group was formed in early 1994 and Håkan Abrahamsson was appointed project manager. Volvo had limited experience in developing such a characteristically niche product, and they were in quite a rush. They therefore chose to cooperate with the British engineering firm TWR, Tom Walkinshaw Racing, who were already involved with Volvo’s racing team in the BTCC. "Without a doubt this was the most fun car project I’ve been involved with," Håkan Abrahamsson says today. Volvo wanted a project manager who was a little younger - preferably one who would be under 40 be the time the car was unveiled. The team had just a couple of months during 1994 to define the project, and they got to work almost straight away with a comprehensive competitor analysis. The project group had to cancel their holidays and instead headed to the south to France to rent and try out coupés and cabriolets from their key competitors. Since they were supposed to be on holiday, they were allowed to bring their families, which turned out to be an unexpected success. Several comments were noted that would not have emerged if it had only been car designers who had analysed the competition. This was hugely beneficial during the continued design work and the team often returned to their experiences with their families. A large part of the design and development work took place at TWR near Oxford in England. Volvo was responsible for the basic technical structure, and determined which characteristics the car was to have. TWR was responsible for design and production adjustment. A complete development team worked in a huge barn where Tom Walkinshaw, TWR’s charismatic owner, also kept his car collection. The project group were given an unusually free hand in terms of shaping the car, and head of design Peter Horbury wanted to change the idea that Volvo design was angular and boxy. When TWR’s Ian Callum showed sketches of a coupé that featured a significantly arched roofline and sculpted sides following proposals that had been considered “too Volvo”, the matter was decided. The design would go on to remain almost unchanged right up to production. The new car had the same wheelbase as the Volvo 850 and was the same length, but it still gave the impression that it was rather more dapper. As it was already known from the beginning that the car would also be produced as a cabriolet, the development team ensured that the design worked both with and without a roof. The development period for the C70 was brief - it took just 30 months from the first studies until the first cars were produced. The collaboration with TWR was crucial in achieving this, and the project costs were more manageable. Volvo's then head of design, Peter Horbury, was clearly enthusiastic about the new language of design represented by the C70: "We threw away the box but kept the toy inside," he said after the first press viewing, where he had driven a saffron yellow C70 onto the stage. The front clearly linked to Volvo, while the rest of the body was significantly curvier than anything previously released by the company - at least the first in a long time. The C70 heralded a new design direction that would characterise many future models. Freedom of choice for the customer was important in a car like the C70, and there were 17 different paint colours to choose between. Solid, metallic and pearl. With 40 different interior combinations with differences in material and colours, the choices were almost endless. It was crucial that the speed matched the appearance. The C70 was therefore launched exclusively with five cylinder turbo engines. The strongest engine, at 2.3 litres and 240 hp, was shared with the Volvo 850R. A calmer version, at 2.5 litres and 193 hp, was also released at the same time, and there were also 2 litre versions offering 180 and 225 hp respectively for markets where cylinder volume determines taxation levels. Despite the C70 being very much an emotional car, where the design governed its function, there was plenty of room for four people and their luggage. And since Volvo developed it, the safety levels were high, featuring a side impact protection system (SIPS), whiplash protection (WHIPS) and belt tensioners and side airbags. Together with TWR, Volvo formed a joint venture company, Autonova, in Uddevalla. Volvo had previously operated in Uddevalla, but production had ceased some years earlier. Now the factory was rebuilt and refurbished to incorporate the niche car. Production moved on from the assembly line principle, and instead a work team followed each car through several stages of production until the next team took over. The capacity of the new factory was 20,000 cars per year. The news that the Volvo C70 Coupé would be joined by a cabriolet was announced at the same time as the coupé was launched. The C70 Cabriolet was unveiled one year later and it was the first convertible Volvo of the modern era. For many years, Volvo had been sceptical about cabriolets for crash safety reasons, but the C70 Cabriolet saw the introduction of features such as ROPS - Roll Over Protection System - with two protective frames behind the rear seat that were activated if the car rolled over. The windscreen frame was anchored to the base plate and manufactured from high-strength steel. The design stood the test of time and did not change significantly during the nine years of life enjoyed by the first generation. The Volvo C70 Coupé was manufactured until 2002, while the cabriolet lived on for a further three years until April 2005. By this time, 76,809 C70s had been built, of which 27,014 were coupés and 49,795 cabriolets. The second generation C70 convertible, featuring a three piece retractable hardtop and built by Pininfarina, was launched at Paris Motor Show in September 2005. 10 things you may not know about the Volvo C70. The C70 had one of the world´s best sound systems at the time. Loudspeakers from the Danish prestige brand Dynaudio, Dolby Surround and an amplifier with up to 4x100 watts. The 17 different exterior colours were developed under the supervision of designer José Diaz de la Vega. He also led the design work for the interior, while Anders Gunnarsson played the same role for the exterior. In Sweden, there is a special club for C 70 owners - the Swedish Volvo C70 club. They are organising a parade from the factory in Uddevalla to the Volvo Museum in Gothenburg in conjunction with the 20th anniversary. The première in Paris could also be followed online - it was the first time this had ever happened in Europe. In 1998, the C70 was ranked as the best Volvo in J.D. Power’s customer satisfaction survey and it came in fifth overall. Finnish firm Valmet produced a proposal for a C70 cabriolet with a tin roof. This did not lead to production, but the C70’s successor was given a roof of this type in 2005. Tom Walkinshaw, the man behind TWR, was an experienced racing driver with three touring car world titles and two victories at the Daytona and Le Mans 24-hour races, respectively. 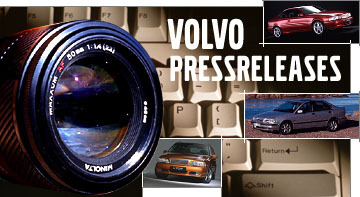 In 1999, Volvo acquired TWR from Autonova and continued production in-house. Later on, Volvo formed a company with Italian Pininfarina. In the film production of The Saint (1996), Simon Templar, played by Val Kilmer, drove a Garnet Red Volvo C70. The film was shot before the C70 had been unveiled, which meant a great deal of secrecy was called for. The preliminary prospectus for the C70 was sparse. It consisted of elegant pictures, a few technical facts and a three line quotation from Peter Horbury: "I’ve tried to create a car that people will want, not a car people need."